The Mundorf speaker is available as a package of parts and detailed plans for constructing the speaker boxes, not actually meant to be sold assembled. 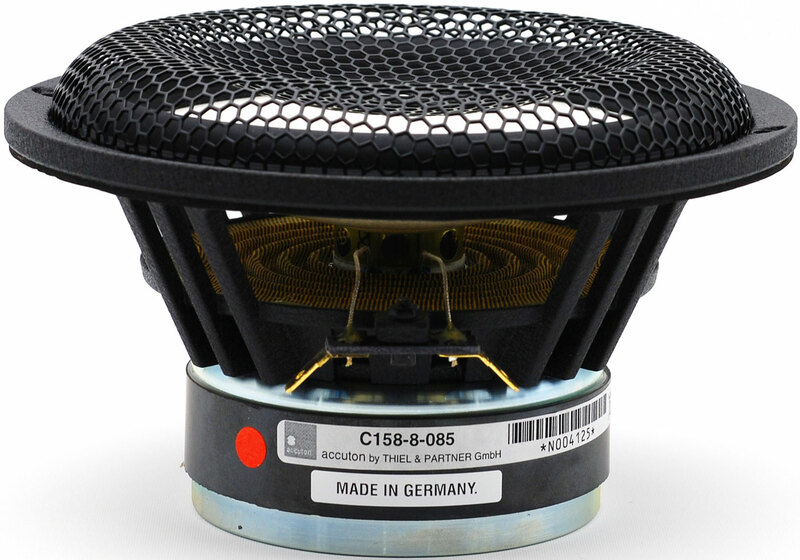 I’m sure many of our readers have heard of the West German company Mundorf in the context of highly regarded speaker crossover parts, such as capacitors, coils, resistors, complete crossover assemblies, wire, fuses, terminals, etc. 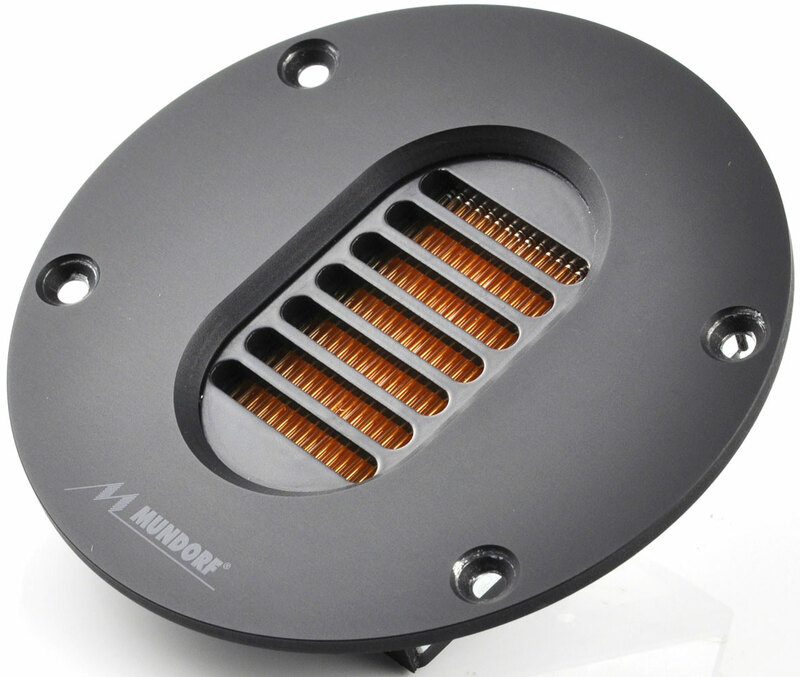 As it turns out, this same Mundorf, along with its extensive parts catalog, also manufactures a rather extensive line of AMT (Air Motion Transformer) speaker drivers and complete ready-to-use crossover assemblies for both the home audio and pro audio worlds. Therefore, offering a full speaker system in kit form is not a real stretch from their established core competencies. My first encounter with the Mundorf MA30 speaker system happened a couple years ago at the sixth California Audio Show in 2015, where the speakers were shown briefly in the Grant Audio exhibit. At that time I noted that the Mundorfs were sporting an AMT driver, of which I am a fan from my current ownership of the Eficion F300, and that the Mundorf sounded quite nice for their size. I made a mental note to revisit them at some point and request a pair for review but that did not come to pass. Instead, a few months ago, I was approached by the North American distributor of Mundorf, Mr. Simon Au, from the audiyo.com website, and was offered an opportunity to review the latest and greatest iteration of the Mundorf-branded speaker kit offering, the MA30 Anniversary SilverGold Series speaker. 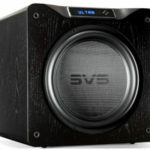 These are offered in two configurations: fully assembled in a high gloss white or black lacquered enclosure at an MSRP of 3,900CAD per pair (roughly $3,100USD), or as a speaker kit without enclosures with an MSRP of 2,630CAD (roughly $2,100USD). Of course, I jumped at the chance and the MA30s are the subject of this review. The Mundorf MA30 Anniversary SilverGold Series Speaker is actually a collaborative effort between Mundorf and fellow German speaker driver manufacturer Accuton. Both manufacturers celebrated their 30-year anniversaries back in 2015. Mundorf and Accuton enjoy a long and storied relationship of cooperation when it comes to Research & Development projects. In fact, it was Accuton that contributed much of the R&D for the MA30 collaboration due to their extensive expertise in utilizing Mundorf parts in conjunction with Accuton drivers in many of their design efforts. This research work notably includes the matching of Mundorf components and drivers to Accuton ceramic drivers. 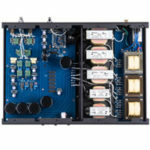 It is Accuton’s engineering and crossover development prowess that are largely responsible for the execution of the end product loudspeaker design in the MA30. 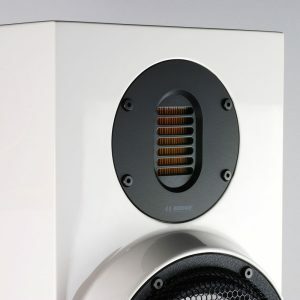 Accuton’s contribution in this design effort begins with their fine ceramic mid-woofer unit used in this diminutive two-way speaker. This driver is then mated with the Mundorf AMT19CM1.1 tweeter unit and the crossover, a design born from Accuton’s R&D labs. These crossovers are pre-assembled with a generous helping of premium parts from the Mundorf parts bin, including MCap EVO and MCap Supreme EVO from the SilverGold range. The fully assembled pair of Mundorf MA30 Anniversary Silver Gold speakers were in sturdy white lacquer cabinets and fully broken in, as they were a demonstration pair from the distributor. 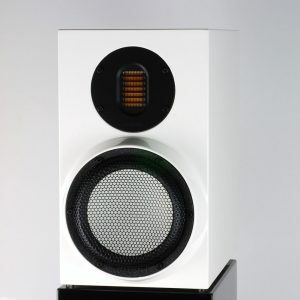 Having already read the speaker’s literature and installation instructions that are published on the main German Mundorf site, I had planned originally to set the MA30 SGs atop the Eficion 300 woofer units and Stillpoints isolation pods that make up a part of my reference speakers, the Eficion F300. Inserting the Mundorfs was a breeze, as the resulting height is nearly spot-on ideal for my seating position. I particularly liked the Mundorfs’ large speaker terminals as they enabled me to hand tighten the bulky and rather stiff Enklein “David” cables to the speakers easily due to their ergonomically savvy rectangular shape. I don’t care much for speaker grills since they all block sound to some degree. It was refreshing to see that Mundorf (or perhaps Accuton) apparently shares this opinion and opted not to offer a speaker grill per se and instead cover the delicate ceramic woofer driver with a hard steel mesh screen. A quick listen while shifting seating positions confirmed that the sweet spot was essentially the same positioning as with my reference Eficion, a very fortunate outcome since I wasn’t looking forward to moving my 100+ pound woofer units! This is the listening position I used for the remainder of the evaluation period. Please note that the Eficion woofer units were not active in this process and the cabinet merely served as stands for the diminutive Mundorf speakers. From the moment the ZYX Yatra moving-coil cartridge touched vinyl, I knew this was going to be an entertaining experience. Right out of the gate, the Mundorf MA30 Anniversary SGS proved to be a well-balanced performer, the AMT driver appeared to be seamlessly mated with the Accuton ceramic woofer unit. Encouraged by what I was hearing, I pulled a wide range of music from my vinyl collection and settled in. Going over my notes, there is a remarkable consistency in my impressions regardless of the type of musical material I played. Putting the Mundorf speakers through the sonic wringer, I started with well-recorded acoustic and vocal works from Neil Young, Janis Ian, Rickie Lee Jones, and Katie Melua. To say that the speakers simply performed well would not do them justice. The Mundorfs exhibited remarkable midrange coherency as they reproduced Neil Young’s somewhat difficult voice along with the accompanying acoustic guitar. Listening to the superbly captured Live at Massey Hall recording, the diminutive Mundorf monitors cast a broad and deep multi-layered image while at the same time delivering intimacy as Neil Young played his acoustic guitar and belted out his classic, “Tell Me Why.” Thanks to the ultra lightweight ceramic midrange/woofer unit and the ultra fast ribbon AMT driver, the MA30s were able to resolve and reproduce a remarkable amount of detail, including room cues. More amazing still is the thunderous applause in the hall afterwards. The Mundorfs have enough bass response to provide a reasonably good image of the immensity of a venue, including height. No, they are not going to shake windows out of their panes, but these speakers have absolutely remarkable bass response and imaging. On one occasion, I just needed to listen to an album because an earworm was driving me nuts. Normally, I would hear my own speakers on these occasions and not a review piece, but it was late and I didn’t want to mess with cables, so I listened to it on the Mundorfs. This turned out to be a great listening session. My 47-year-old UK pressing of Gentle Giant’s Acquiring the Taste was pure fun and the Mundorfs were more than up to the task. It was, in fact, remarkable that the MA30s did bass so well. One tends to forget that it is just a diminutive two-way monitor. On the cut, “The Moon is Down,” the tympani strikes carried very nice weight and textural substance in each strike without even a hint of boxiness. The magic of the AMT driver was in full effect. In fact, truth be told, the Mundorf units were sounding quite a bit like my reference Eficion F300 at $16,900. Other listening sessions yielded similar comments. The Mundorf MA30s were articulate and engaging through all the LPs and CDs I challenged them with. On live recordings especially, they flat out disappeared as the venue took shape and the performers emerged. This held true with female vocals, such as Katie Melua or Rickie Lee Jones, as well as with male vocals. On dynamic rock recordings, the MA30s acquitted themselves remarkably well and delivered plenty of head bobbing goodness with an impossible amount of clean and tuneful bass. The Air Motion Transformer driver bestowed this speaker with superb detail, speed, and dynamics without ever sounding strained, edgy or compromised in any way. 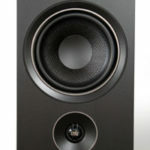 Marrying this driver with the ultrafast and lightweight ceramic woofer/mid unit gave the MA30s a top to bottom consistency that is extremely rare for a two-way at any four-digit price. I could go on and on about how much these speakers impressed me, but I think I have made my point. 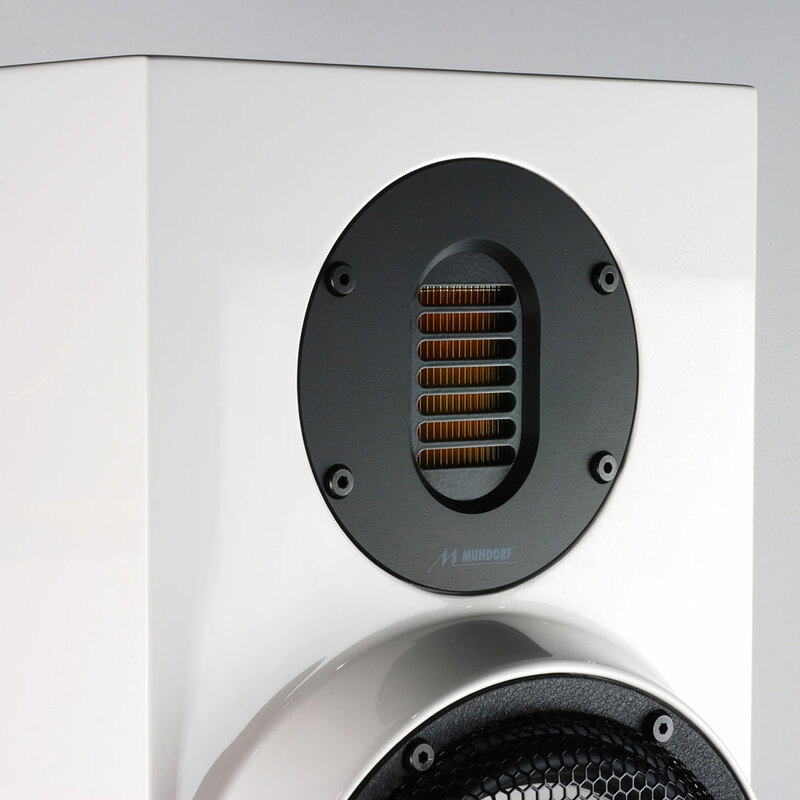 Speakers are a very personal choice and have the power to make or break a great home system. The Mundorf MA30 Anniversary SilverGold speakers are, to my ears, an engineering marvel. When either purchased as a kit or fully assembled, to my knowledge there are no speakers that deliver the sheer likeability, musicality, and tonality that these do at anywhere near their asking price. I would like to thank Mr. Simon Au for the opportunity to experience the Mundorf MA30 SilverGold Speakers. 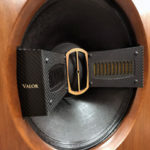 They are indeed a magnificent two-way monitor and a must listen if you are in the market for a stand-mount speaker. We, at Audiyo Inc and Mundorf would like to thank you and your team for this comprehensive review and enjoyable read of the MA30 speakers. Knowing that you had such a positive experience with these speakers indicates that the Mundorf and Accuton collaborative efforts was well worth it. Ray Seda, thank you ever so for you post.Much thanks again.